The Matrix Organization Structure is a readymade PowerPoint for business and management professionals. 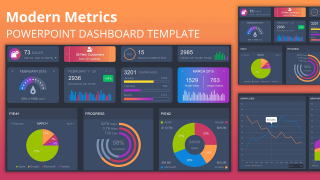 The template helps display the company’s framework with very creative and engaging graphics. 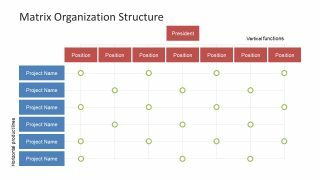 The rows and columns table format aids in understanding the hierarchical structure of an organization quickly. This matrix organizational structure also helps the employees to comprehend the process of how information flows through the functional departments. 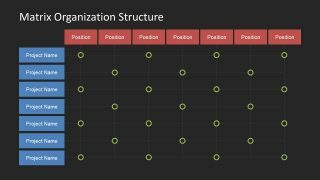 The matrix org chart template is an incredible design assisting business executives to explain the roles and responsibilities of employees. The hierarchy of functions defines different position levels in rows and their dependencies. 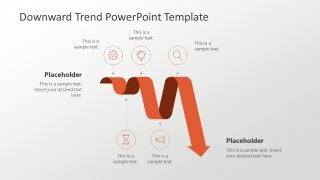 Therefore, this PowerPoint is useful graphical visual for an effective communication about certain topics. Such as chain of management, allocation of task and duties, guidelines for coordination and supervision etc. 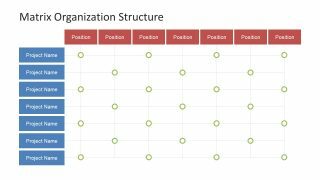 The table design of Matrix Organization Structure is a creative template to overview operational strength of company. It is a 5-slide PowerPoint with variation in the original design of organization structure template matrix. Like a work break down structure (WBS) for a project, the organizational breakdown structure also works in a similar pattern. Therefore, in this PowerPoint table, the top-level shows president i.e. CEO, board of directors etc. Whereas, from top downwards are the vertical function and projects/products along the horizontal lines. The intersection of functions and projects are denoted by circular nodes to easily track roles and responsibilities. The further slides show translucent arrow to the downwards and in right direction of process flow. 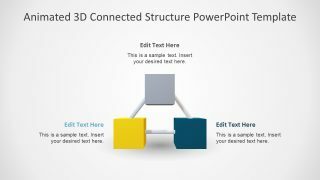 The slides of matrix organizational structure are editable PowerPoint template enabling users to change various designing aspects of this presentation. For example, change the background of slides by clicking the background format button in design tab. It opens a toolbar on the right with options like solid fill, gradient, picture or texture and patterns. 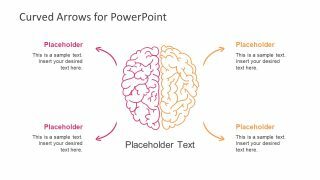 Also, customize individual PowerPoint icons like, the position, project and intersecting circle nodes by changing colors, resizing or repositioning them.